On my second Sunday away from the studio, I'm writing this ahead. 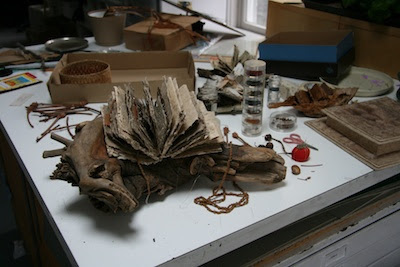 Today, Thursday, was a wonderful day working on the Spirit Books. I have three new ones under construction and discovered a book that I didn't use in the past that fits perfectly on a holly branch from last winter. I have some more sewing details to do on the pages of the books and then assembling them. I have the joy of handwork before facing the more demanding precision (or at least as much as I can muster) of the stands. My goal is to have them all ready to greet the new year. so good to see these new spirit books coming into being!